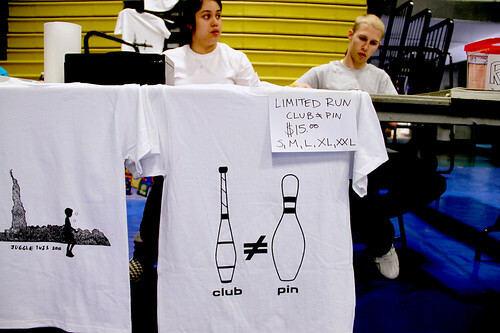 Do you get upset when non-jugglers call clubs “pins”? Do you find it necessary to correct them? Whenever I hear a juggler correcting someone’s word choice, I think: “Well, we just lost another potential friend/fan/juggling partner.” Why not hand someone a so-called “pin” and let them learn to toss it from hand to hand? No reason to act superior because you know a different word. I’d correct them, but in a nice way. I mean, really…if you are a juggler, you know what those people are talking about. I think it’s more offensive when people find out you can juggle and they say “oh, so you’re a clown or something?” NO!..we are NOT clowns! In Fr﻿ench the word “quilles” is used by jugglers and bowlers for their different objects. Vive l’indifférence! A recent New York Times article about the Brooklyn-based Jugglers Anonymous club refers to clubs as “pins”, rings as “hoops” and cigar box as “cigar-box”. It seems the renowned New York Times Manual of Style and Usage doesn’t cover juggling terminology. Kip, of the world-famous King Charles Troupe, calls his unicycle a “bike”, even though “bike” refers to a two-wheeled vehicle. I frequently refer to my cigar boxes as “blocks”. Cigar box manipulation is somewhat esoteric, and few people outside of the juggling world know what I’m referring to when I say “cigar box”. I find that calling them “blocks” makes life much easier. For the record, I frequently refer to juggling clubs as “pins” for the same reason. When I say “club juggling”, laypeople often think of juggling in a night club. When I use to word “pins”, I find I am understood much more readily by non-jugglers. What are your thoughts? Please let us know! I usually correct people in a nice way as i giggle to my self noticing that nobody can ask “you’re a juggler”? without doing the juggling hand movement with the invicible ball while singing the 5 thousand year old circus tune. But for the most part, if people show excitment and interest in my profession I don’t get fustrated or angry, it’s just not a big deal if people don’t know the proper names of the objects that we juggle. hell, i still don’t know the names of all the tricks i do, and i’v been juggling for a long time!